Hanging basket in a maple tree. Basket contains impatiens and begonias. Red container with Coleus — Solenostemon scutellarioides 'Cathedral Windows'. A summer without annuals is like a spring without flowering bulbs. 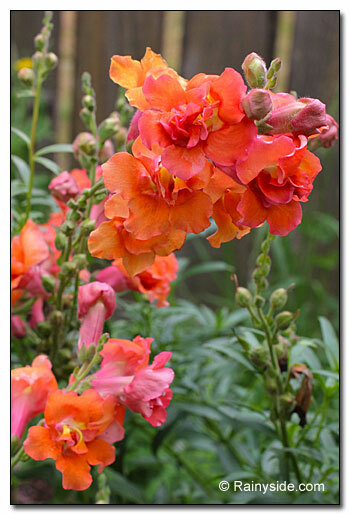 It is time to dress-up a drab garden in a kaleidoscope of summer color with seasonal plants. When your garden passion turns into an obsession, you can fill your garden and containers with plants until they overflow with bright-hued flowers and textural foliage. The fastest and most popular way to do this is with annuals. Garden centers stock their tables with exciting new flowers — propagated for better color, longer-lasting flowers, and new and improved foliage — alongside tried and true plants homeowners rely on every year. Annuals bring zest to a garden border without having to wait for a plant to settle in for a few years before it flowers. Shrub, perennial, and bulb flowers ebb and flow through the summer season, while annuals and tender plants continuously dress the garden in full color. Annual flowers fill containers with blossoms, provide nectar for hummingbirds and butterflies, and make you smile. The beauty of annuals comes from the almost instant gratification you get when they fill in an area quickly. In addition, you can change the look every year. If you didn’t like the purple million bells (Calibrachoa) hanging down the dark rock wall last year, choose another color this year. When you are tired of the same golden creeping Jenny (Lysimachia nummularia 'Aurea') trailing down from your containers, plant a Gold 'n Pearls™ bacopa (Bacopa 'Olympicgold') with variegated golden leaves and white flowers instead. Changing the look of the garden is easy. The hardest part is what to choose when looking at an impressive display of choices at your favorite local nursery! 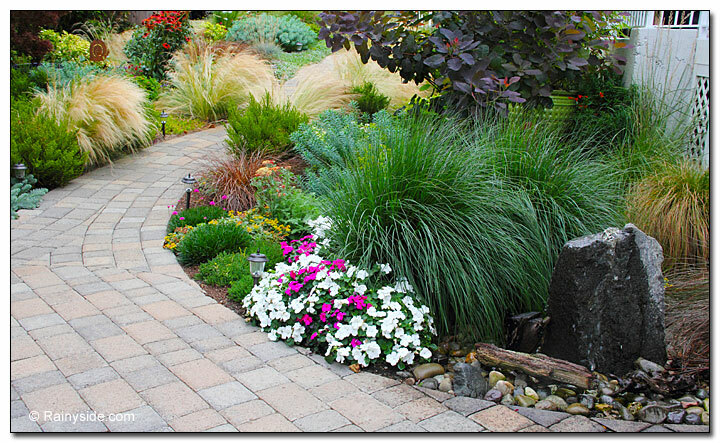 For new gardens, annuals fill in the spaces between the permanent plantings of shrubs, trees, and perennials. Rather than planting permanent plants close enough for an instant display, and having to remove them from the garden later, annuals fill the void between. Covering the ground with plants helps suppress the opportunistic weeds that take over open ground. You can also plant annuals around your spring bulbs when they finish flowering. The bulb foliage, a necessary eyesore, feeds the bulbs for next year’s floral display. Until the leaves die back to the ground, they are unsightly during the process. Planting annuals to grow up, as the bulbs are dying down, helps minimize the unappealing foliage and gives the space two seasons of interest. Because annuals grow their entire life in one growing season — they flower, set their seed for the following year, and then die — we can count on them to give a massive display of flowers until they complete their life cycle. Tender plants can be anything from perennials, grasses, and shrubs. Many sold as annual plants, they are not hardy in our climate. However, they can be wintered over in a greenhouse or garage and used again for the next growing season. From the formal to cottage garden styles, annuals fill many niches in the garden and suits countless garden designs. 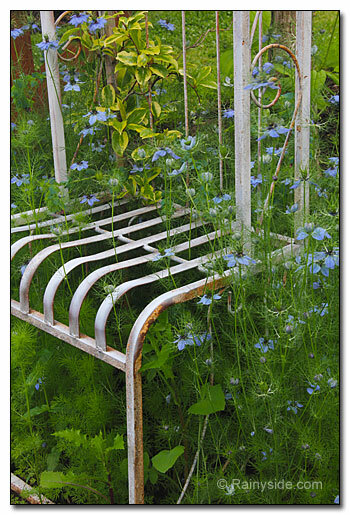 Many of the plants’ common names evoke romance, or quirkiness, such as love-in-a-mist (Nigella damascena) whose flowers grow in mist-like ferny foliage. Some names describe a feature of the plant as with the beautiful black-eyed Susan (Thunbergia alata) with its cheery orange-yellow flowers with a dark center. Farewell-to-spring (Clarkia amoena), our flowering native annual west of the Cascades, gives us spring to summer blasts of color. Tender plants normally utilized as houseplants are grown as seasonal outdoor plants, sometimes mixed in with other plants in the ground or above. 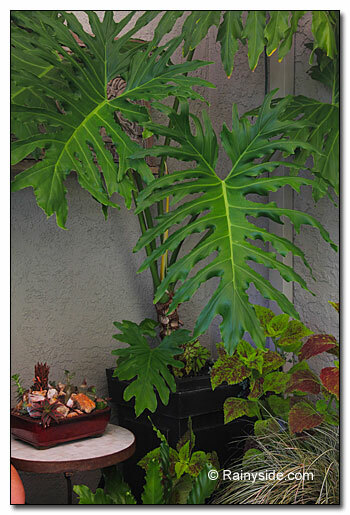 Bold foliage plants such as split leaf philodendrons (Philodendron bipinnatifidum) add architectural elements to a shaded area. The most exciting annuals and tender plants make grand statements in the garden. Growing them in containers is the most popular way to utilize them. 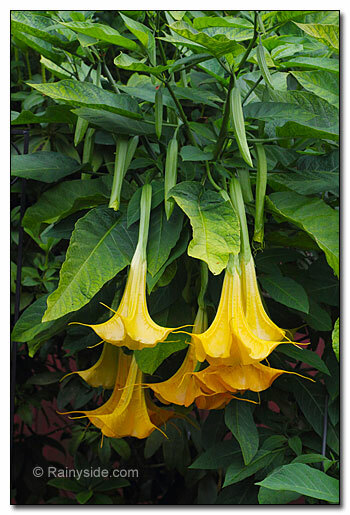 The show-stopping Angel’s trumpet (Brugmansia 'Charles Grimaldi’) gives the hint of the tropics with big leaves and gigantic flowers. When the shrub grows in a pot, bring it into a garage or greenhouse for winter protection. 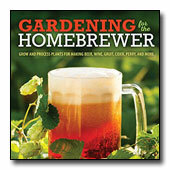 Some gardeners even grow the shrub in the ground and dig them up in the fall to winter over indoors. The following spring after danger of frost passes, it is planted in the garden again. 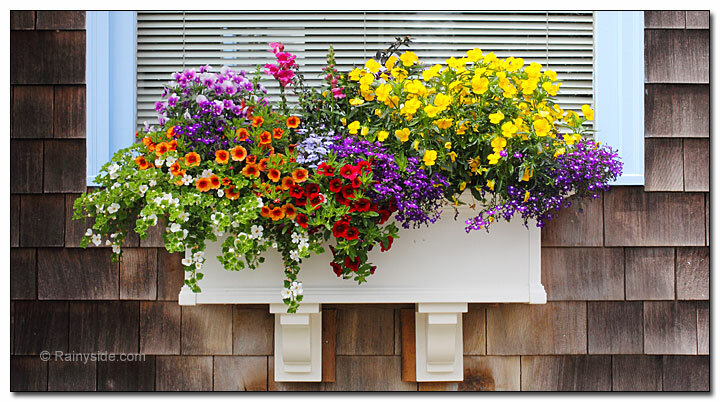 A white window box filled with pansies, million bells, Lobelia, snapdragons and bacopa will dress a window in a riot of color. 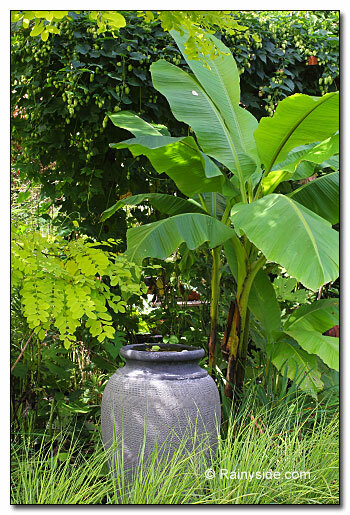 These days people are making containers out of almost anything that will hold soil. 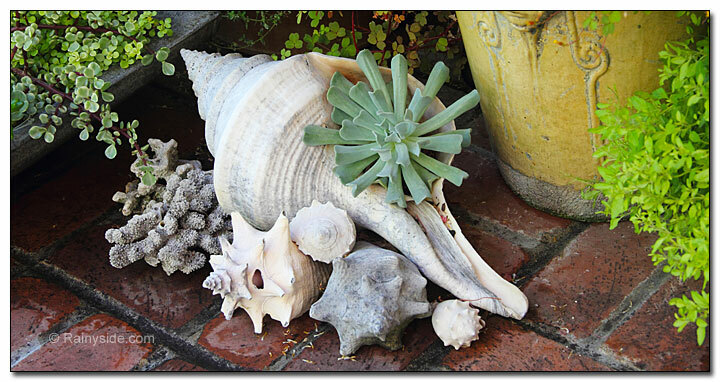 From seashells to tricycles, if a creative gardener can repurpose something that holds soil, they are going to plant in it. 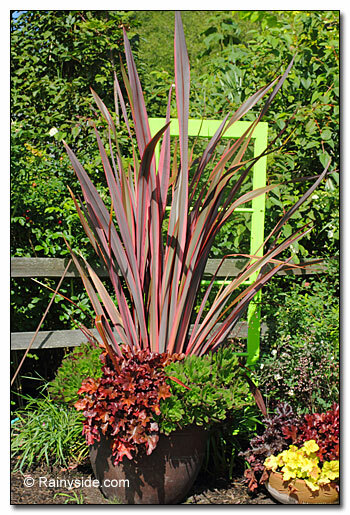 Petula Plants located in Poulsbo, Washington brought a touch of the tropics to their gardens and containers with borderline hardy, large-leaved banana plants (Musa basjoo) and New Zealand flax (Phormium). Many of their pot designs planted in containers line the streets of downtown Poulsbo. Their pots have featured tender shrubs and perennials such as Citrus limequat ‘Eustis’, Agaves, and Echevarias as well as many other tender plants mixed in with hardy plants. Many of their container displays rely heavily on fantastic foliage plants. In shady areas beneath conifers that have masses of roots that make the ground impossible for anything but sword ferns to grow in, a pot of impatiens and begonias, or other shade tolerant plants can bring color to a dull, dark space. Buy a large colorful container, plant it with vivid, shade-tolerant plants and add a spike (Cordyline australis) for height. 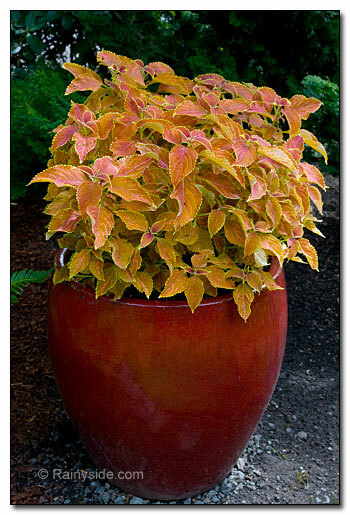 Elevate the pot with ceramic risers or bricks so it does not touch the bare ground. This keeps the tree roots from growing up inside the pot and provides air circulation underneath the container. 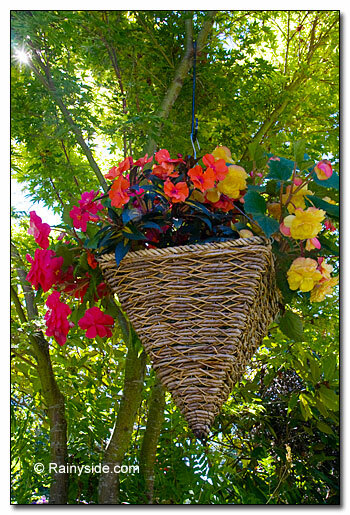 Alternatively, you can suspend a hanging basket from a maple tree branch to bring an unexpected spot of color above the ground. An adult-size tricycle past its prime planted with begonias, impatiens, and ferns and staged under the deep shade of a conifer brings an element of humor to an otherwise dull and dark,shade garden. 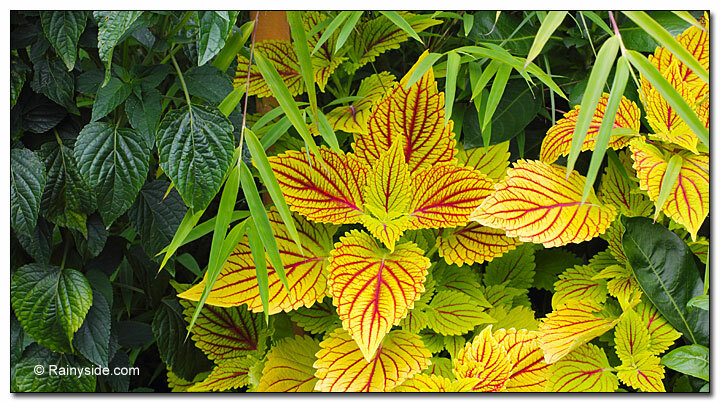 For a captivating garden vignette, nestle in a bright foliage Coleus (Solenostemon scutellarioides ‘Cathedral Windows’) with shadowy green foliage. 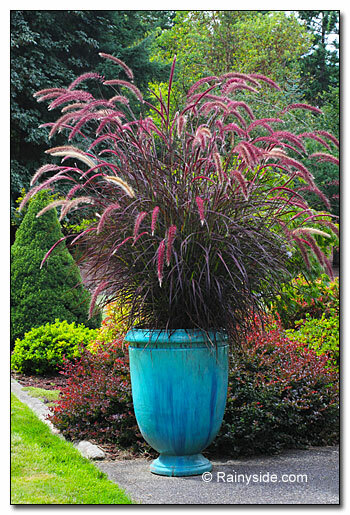 A large pot holding one lone purple fountain grass (Pennisetum setaceum 'Rubrum') sits on a sunny corner of a patio as a sensational focal point in an otherwise modest garden. 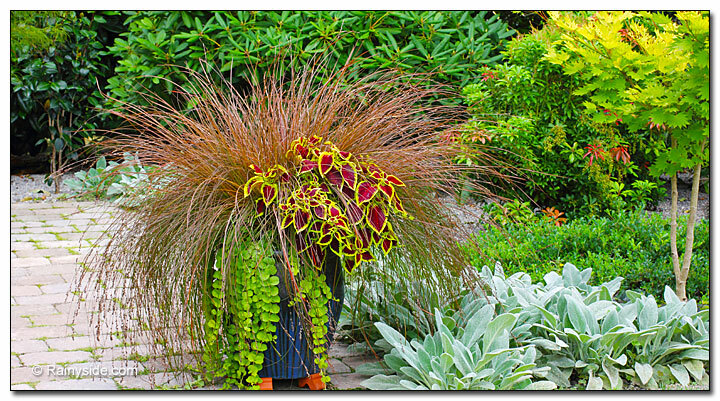 Mixed in with other plants in a container, the grass can take a leading role as the tallest plant in most arrangements. 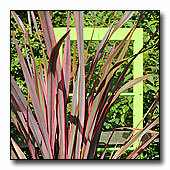 Fountain grass grows equally well in a garden setting. It is a fast grower that quickly becomes the center of attention. The most often used flowers are popular for their reliability, fragrance, or long-time flowering. What a treat for our senses! Planted in baskets, containers, and as a fragrant annual ground cover, sweet alyssum (Lobularia maritima) covers itself with tiny white flowers covering the low growing plant which fills an area with a whispering sweet aroma all summer. Another fragrant annual is candytuft (Iberis odorata), which grows in poor soil and gives the garden the sweetest scent this side of heaven, if you don’t pamper it. Who can resist the charm of a handful of annual sweet peas picked straight from the garden? In the late afternoon and into the evening, flowering tobacco (Nicotiana alata var. grandiflora ‘Fragrant Cloud’) will reward you with an intoxicating fragrance. When the white, star-shaped flowers are in bloom, you can throw away your air fresheners. A drift of flowering tobacco growing close to an open window will fill a room with its sweet aroma. New Zealand flax (Phormium 'Guardsman'), Coral bells (Heuchera 'Electra', and succulent Aeonium 'Blushing Beauty' in a container. Coleus (Solenostemon scutellarioides'Cathedral Windows' nestled in with green foliage. 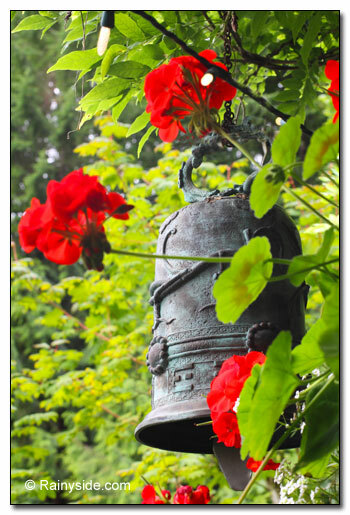 Geraniums (Pelargoniums) in a hanging basket provides a spot of color in a sea of green. 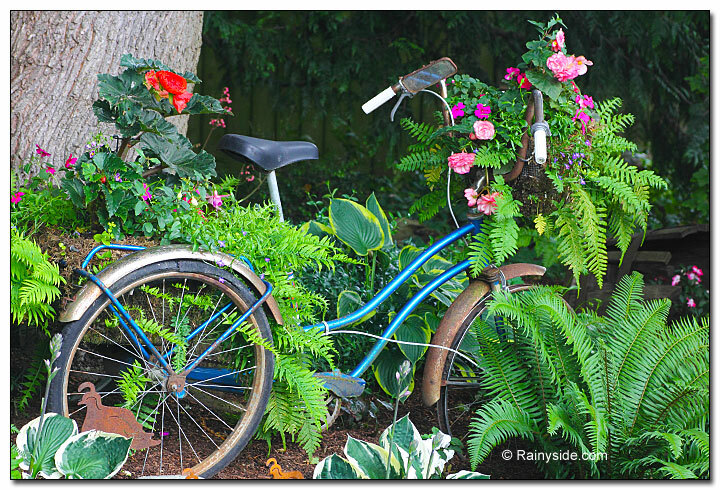 Tricycle planted with begonias, ferns, and impatiens. A spot of color provided by white and fuchsia colored impatiens along a path. Window box filled to overflowing with pansies, snapdragons, million bells, Lobelia, and bacopa. 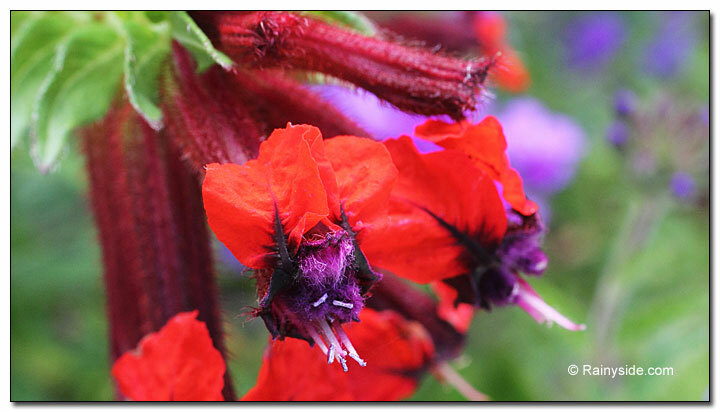 Bat face cuphea (Cuphea llavea). Shell planted with succulent Echeveria runyonii 'Topsy Turvy'.